Sorellina, the "little sister" of acclaimed Chef Jamie Mammano's Mistral, provides an intense look at regional food with a modern twist. Chef Mammano and Executive Chef Robert Jean have created contemporary Italian-Mediterranean cuisine in an upbeat and sophisticated environment. Sorellina's wine list features hidden Italian gems to compliment any dish. The restaurant's decor evokes a sense of comfort and sophistication with its warm, modern design complemented by the glow of the back-lit wall mural and floor-to-ceiling windows. 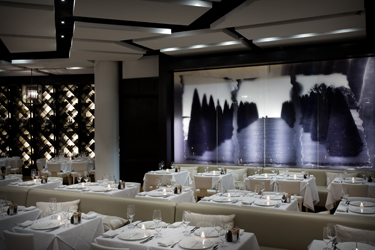 Sorellina features 126 seats in the main dining room and an additional 20 seats in the bar/lounge. The restaurant is open seven nights a week. Located at One Huntington Avenue in the heart of Copley Square, guests of Sorellina are invited to use our complimentary car service for transportation within metro Boston. Valet parking is also available from 5:00 pm to midnight daily. "Sorellina spares no expense, and the food is priceless"